In September of 2009 I received an email inviting me to travel to South Africa in October 2010 as a delegate representing the United States at the Third Global Congress on World Evangelization. I was so excited that I jumped out of my chair and danced around the room! I couldn’t believe that I had been selected as one of 4000 leaders of the global protestant Church! You don’t have to know me well or long before you figure out that I have a heart for the future of the Church that doesn’t fit within national borders. The opportunity to take part in the largest and most diverse gathering of Church leaders in history is something that continues to thrill my soul to the core. How do we make the case for Truth and the uniqueness of Christ in a postmodern, pluralistic world? How do we articulate and demonstrate the power of the Gospel in the midst of suffering and strife? How do we respond redemptively to religious fundamentalism – Islam and Hinduism in particular? What should our priorities be with respect to the unfinished task of world evangelization? What are obstacles to world evangelization within the church and how can those be addressed? How should the church in the US partner with the church in the rest of the world? I have a heart for the Church of tomorrow, and a calling to take an active role in shaping it. Today’s youth have a greater need for Reality than any previous generation in the history of the planet, and God is going to meet it. I want to be there. I want to stand in any gap God gives me to bring about the restoration of God’s people to Himself. Lausanne is my next step. I do not know all that God is going to do in and through me in Cape Town, but I know I’m called to be there. I will be perhaps the youngest and least qualified attendee, but I cannot wait to encourage and be encouraged. I will challenge and be challenged. I will ask new questions and encounter key answers as I experience the meeting of the leaders of the Church from every corner of the globe. And I will walk away as a changed man, with a greater passion for Jesus, a greater love for His Church, and another step further in my quest to change the world. In July of 2007 I lost my camera/laptop bag with nearly all of my equipment; nearly $9000 worth of gear was gone. Less than a month later I was in China on a month-long photographic expedition followed by another 6 weeks in Southeast Asia documenting the lives of missionaries. Before I left for China and the Far East I had received over $1500 in gifts from friends enabling me to replace some of the key gear I had lost. This made for the first photographic trips for which I had ever received financial support. To this day I consider the images I created in Asia in 2007 to be some of my best, and I attribute that to the love, support, encouragement, and prayers of those who stood with me. I do not want to attend Lausanne alone. I know that God could provide for me in many ways, but I believe that I go to South Africa as a member of the Church, representing the Church, and that you, my brothers and sisters in Christ, are the Church. So I humbly ask, will you join with me in this endeavor, supporting the work of God in my life and in the global Church, furthering the Gospel of Jesus Christ in the hearts and minds of His people? I need your love. I need your prayer. I need your encouragement. I need your financial support. My estimate is that the 2-week trip to Cape Town will cost between $6000 and $8000 for me and Jocelyn to go. This money will go towards our plane tickets, hotels, transportation, food, and conference fees. Thank you for supporting for me as a minister of the Gospel. Click the button below to place a secure donation, or tax-deductible gifts can be given through Worldchangers Summit | Box 643, Waite Park, MN 56387. Any gifts in excess of what is needed to attend Lausanne will be used for the 2011 World Changers Summit. It's true. I'm hosting photography workshops here in Portland, OR the whole month of July. I've got a great group of friends coming out to help me with different parts too... Carl Larsen and I will be teaching a DSLR Video Workshop July 5-9. Check out our video post too: DSLR Video Workshop Katie Bollinger and Christina Dickson will be teaching a workshop on Portraiture & Lighting that same week. These are great workshops and Portland is an awesome place to study photography. I think you'll love our camp-style photography experience and love your dedicated Christian instructors. 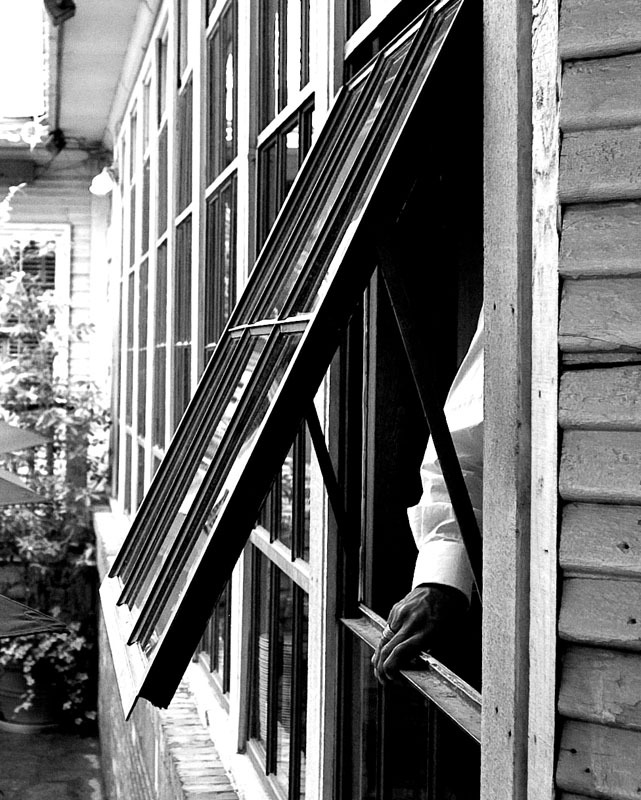 The Open Window was shot in the West End of Dallas, TX during an IPS workshop I was leading. The students were shooting black and white for the day, so I was too. Here I happened to catch a waiter's hand on the edge of a window he had just opened. I love the feel that we are just catching a glimpse of the action in this photo, yet something that no one else is seeing.